With the global success of iPhone and iPad, many businesses are embracing the Apple platform. Along with these mobile devices, sales of Mac computers to business are growing. A decade ago, the Mac was an uncommon sight in many businesses and routinely ignored by corporate IT. 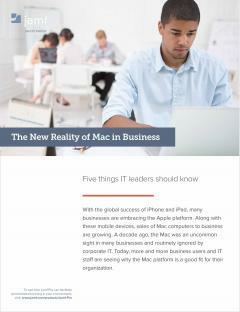 Today, more and more business users and IT staff are seeing why the Mac platform is a good fit for their organization. In this Enterprise Brief, we’ll share the five things IT leaders should know when deciding whether to incorporate the Mac platform into their organization.